Want to cuddle with Monique? Monique Darling, workshop facilitator extraordinaire has led over 800 workshops in the past 5 years. She is the founder of Juicy Enlightenment an organization dedicated to empowering people who are questioning the assumptions of how their life should be and to offering tools for self expression that create trust, inner knowing and wisdom to enjoy the life they have. Her primary purpose is helping folks bring out their vulnerability, energetic embodiment and fearless relating.She guides from a place of understanding and her natural exuberance is infectious! She is available for private sessions, experiential workshops and Cuddle Parties. 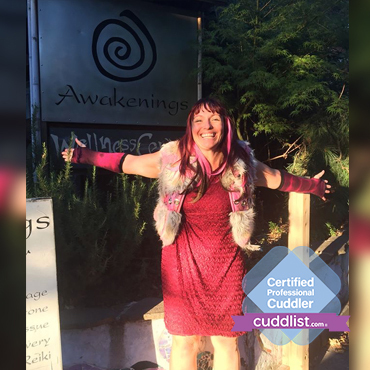 Reiki Massage Cuddle Party Facilitator literally wrote the book on Cuddle Party. World Traveling Workshop Facilitator. Authenticity and Vulnerability Coach.